In early October Fr. 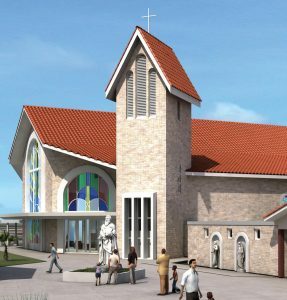 Houle officially kicked off our parish campaign at Masses by explaining the plans to address many parish needs along with a virtual fly-through of the proposed new church and Eucharistic Adoration Chapel. There was also a message of support from Fr. Kelly, our Honorary Campaign Chair. With a campaign goal of $8 million, Fr. Houle shared some great news that as of early October, 74 families and individuals have made initial pledges that total over $2.5 million! We are on our way! Note: Details are yet to be worked out and decided upon. This video only gives an idea of placement and anticipated overall look for the proposed project. Many volunteers are needed to work on our campaign. Time commitment is generally a few hours per week over a three month period. When you are asked to help as a volunteer, please say yes! You can also contact the parish campaign office at (904) 249-2600.